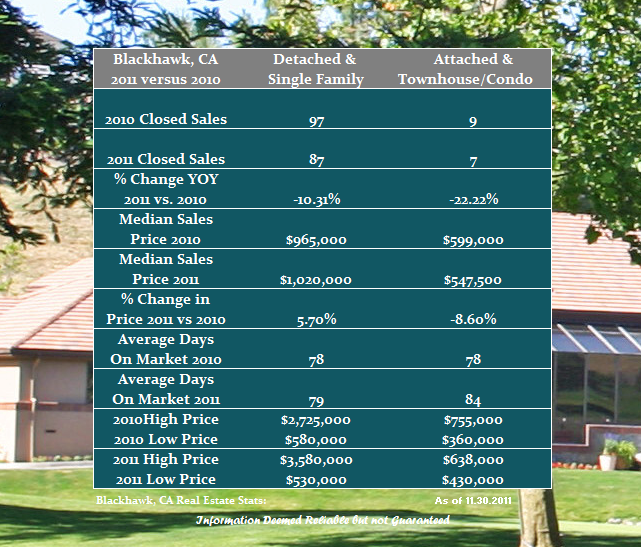 The Blackhawk real estate market has closed out the first eleven months of the year with a few bright spots. While the number of homes sold so far this year has failed to keep pace with 2010 it is nice to see that median sales prices have risen almost six percent. The time to market a home has held steady at less than three months. The townhouse and patio home segment has held up better price wise than the surrounding communities. Now it is time to enjoy the Holidays but if you are interested in buying a home in Blackhawk or looking to bring yours to market I am always here to help. Share the post "Blackhawk 2011 Real Estate Review thru November"
Doug was wonderful to work with! He helped us sell our home with a short sale.